The verb “can” is central to a more complex understanding of the notion of potentiality, and it is the verb that Agamben has gone so far as to declare the singular term denoting his entire body of philosophical enquiry(4). The verb ‘can’, in all of its troubling ambiguity, is a liminal verb insofar as to say “I can” signifies that one has the capacity to do something, but this capacity or faculty does not necessarily entail a moment of actualization. True potentiality, which Agamben postulates as the ‘existence of potentiality’, is precisely when one possesses the capacity at hand and must negotiate ethically with oneself regarding its actualization or non-actualization. We all know the bad, adolescent joke, which, in essence, embodies the profound depth of potentiality, when as teenagers, our parents would say “can you clean your room?” and one replies “yes I can”, but of course never actualizes this gesture of cleaning, never raises a finger, since “can you clean your room” is not an imperative order but rather a question as to the existence of one’s capacity to clean. The existence of potentiality, which Agamben frames as the basis for life itself, lies in this zone of indistinction where a coincidence of two, seemingly opposed systems, the capacity to act and the capacity not to act, meet and produce an unknown, un-named topology. It is within these indistinct zones, that the need for ethics arises, since, again, like our lazy adolescent, there is no mere task that must be fulfilled, no moral imperative(5), but rather an ongoing negotiation of one’s capacity (and the inherent inverse, incapacity) that constitutes the seat of ethical being. Rather than formulating a notion of potentiality that is forever bundled with the productive capacity of actualizing, we are instead confronted with the troubling position of a radical inoperativeness situated within the notion of capacity itself and the fullness of its meaning. Agamben calls on various examples of people who fulfil their incapacity as potentiality, like the poet who does not write and the much discussed Bartelby, the Scrivener, who instead of refuting his job, simply ‘prefers not to’, to the bafflement of his employer. These figures exist in potentiality, for they actively contemplate the relation between their capacity to-act and their incapacity not-to-act. By engaging the capacity of incapacity in dialogic-thought, potentiality is not something that ‘grinds-to-a-halt’ when actualized, it is rather a form of potentiality that ‘gives itself to itself’, that ‘preserves itself(6)’ in actuality and perpetuates its very existence. The zones of indistinction, exemplified in the existence of potentiality shift away from the dichotomous disposition of the term in it’s potential / actual configuration, but rather, point to what Agamben calls “di-polarities”, not as “substantial”, but as “tensional”(7). The inclination to frame this as a dialectical state, should be carefully considered insofar as it would be a forever incomplete dialectics, since the very thing at stake in this conception of potentiality is the maintenance of tensionality that produces indistinction, as such, it is purely anti-synthetical. The di-polarity that constitutes the seat of potentiality in its complexity, could better be imagined as a Moiré pattern of sorts – where two categories of shape meet and produce a visual interference. The interference pattern is not a result of an emergent synthesis, but rather the result of the optical tensions of overlapping systems of pattern. Important in this example is that the different categories (those of opposing shape) must interfere and overlap to produce the optical illusion – the categories of difference do not cancel each other out in their overlapping, but coincide as a result of the tension between different forms. The existence of potentiality, in it’s tensional, capacity-incapacity ‘dipolarity’ is the underlying crux of the more overtly political argument posited by Agamben, in his, perhaps, most well known character Homo Sacer. Above all, Homo Sacer, as a sacred being who can be “…killed and yet not sacrificed, [who is] outside both human and divine law…”(8), he is reduced to bare-life and banished from the polis, outside the jurisdiction of ‘normal’ law. Homo Sacer’s existence opens up a zone of indistinction insofar as he is simultaneously a being who can be killed, (and not sacrificed as in a godly order), yet if he is killed, he can be killed with impunity. Homo Sacer’s situation as a marginalized, banished object reduces life to its most basic biological function (in Greek ‘zoe’, which is the domain of life associated with all living things, kings, gods, animals(9)). The ‘bios’ (in Greek there are two words for ‘life’, ‘zoe’ described above and ‘bios’ the domain of political life enjoyed by citizens of the polis) of Homo Sacer has been stripped foregoing the status of the ‘citizen-subject’ of the polis, who has a political (and therefore juridical) status. Homo Sacer, however, does not merely get pushed outside of the ‘bounds’, or live outside of political citizenship, but remains included in a relation to the sphere of legislative decision making, of juridical distinction making due to his ‘passing-through’ of the exceptional juridical order. It is however important to recognize that the exclusive inclusiveness involved in the designation of ‘bare life’, of banishment and marginalization, are not restricted to those blatant examples of Nazi camps or Guantánamo Bay, but constitute “…the decisive event of modernity [that] signals a radical transformation of the political-philosophical categories of political thought(10)” where ‘zoe’ enters the sphere of the polis, and bare-life itself becomes a political object, and naked life is wholly desubjectivized. The existence of potentiality and its inherent zones of indistinction, exemplified by a diverse set of characters, from the lazy adolescent, to Bartleby the Scrivener, to Homo Sacer, is a testament to its liminal ethical status. After all, where else could one situate and write about such drastically different figures as pertaining to a common order. The zone of indistinction is neither good nor evil as such, but exists as a conceptual topology in the understanding that such indistinctions underlie the articulation and enactment of all distinctions, and orders of partitioning drawn out on places, bodies and roles. It is the recognition of the existence of potentiality, the un-named and undelineated foundation of indistinctiveness that calls out for an ethics of such an order. The in-between state of potentiality, the state before distinctions are carved out or actualized, is the seat of such an ‘indistinct’ ethics, and points to notions of equality elaborated by Jacques Rancière which can help us to better formulate a politics of indistinction, a politics of potentiality. The foundational ‘equality’ that Rancière addresses in his conception of politics, speaks to the indistinctive zone insofar are those who ‘obey’ must have the equal capacity of understanding what to obey and that they should obey; they have the capacity to “recognise” power (aesthesis) “but not […] to possess it (hexis)(13)” Every social order rests on this elementary potentiality of equality, every system of power and hierarchy rests on this fundamental indistinction before the operations of actualization take over and parcel out roles, delineate bodies and map out places. The equal capacity presupposed by any social system is that of an aesthetic order, for it is precisely the equal capacity to perceive and recognise the distribution of inequality, of power, vis-à-vis the inequality in the possession of power. The unpossess-ability of aesthetics is where the shared equality of comprehension is manifest, in the appearance of that which cannot be apprehended. “The problem is not to accentuate the difference between the existing equality and all that belies it. It is not to contradict appearances but, on the contrary, to confirm them. Wherever the part of those who have no part is inscribed, however fragile and fleeting these inscriptions may be, a sphere of appearance of the demos is created […] the power of the people exists. (14)” The domain of aesthetics is where one can recapture the existence of potentiality and release it from its restricted twinning with perpetual actualization. Like Agamben, Rancière sets up an ‘exclusive/inclusive’ paradigm of sorts, in his outlining of social structures, describing two distinct categories, the ‘police’ and ‘politics’ which imply one another in their referentiality. Rancière uses the term ‘police’ (in a non-pejorative fashion) to delineate, “… the set of procedures whereby the aggregation and consent of collectivities is achieved, the organization of powers, the distribution of places and roles, and the systems of distribution and legitimizing this distribution. (15)” Politics, for Rancière is, rather, “antagonistic to policing: whatever breaks with the tangible configuration whereby parties and parts or lack of them are defined by a presupposition that, by definition, has no place in that configuration – that of the part of those who have no part. (16)” The ‘police’ is the actualized domain of social operativeness, as the collection of institutions and conventions that carve out the partitioning of places, peoples and roles, inscribing inequality and distinctions amongst its constituent parts. Politics, on the other hand, is wholly unactualized, it is the existence of potentiality reasserting itself, reappropriating the indistinction of equality at the contingent core of social structuration. The ethos of politics proper, is not the calling out, or pointing to the existent ‘actualized’ order of roles, people and places, but rather the ongoing excavation of the fundamental equality grounding any social system and the legitimating apparatuses of that system. Re-inscribing potentiality where only actuality appears, is an effort to intervene in the core processes of demarcation and partitioning, of releasing the imposition of actuality from the generic notion of potentiality. The operativeness of the actual, the distinct and the unequal are held in di-polar relation to the inoperativeness of the existence of potentiality, the zone of indistinction of fundamental equality. The ethical relationship implied by the inoperativeness of the existence of potentiality (for Agamben, life itself) is one of openness and confrontation with one’s impotential – it is a grasping and ongoing witnessing of one’s incapacity, an ethics before actualization and distinction-making. Potentiality, in all of its richness of political signification, is nothing less than a movement of de-actualization, an unravelling of the thresholds that delineate the instantiation of inequality and modes of distinction-making. Potentiality is the reinstating and constant verification of the presupposition of equality, the zone of indistinction that constitutes the root of all forms of social organization – it is the very faculty of non-consensus which both can and can-not, (and recognises itself with this relation of di-polarity), instigate the appearance of other worlds and other constellations of what is at stake in the politics of being as such. 7. Gilson, Erinn Cunniff. “Zones Of Indiscernibility: The Life Of A Concept From Deleuze To Agamben”. 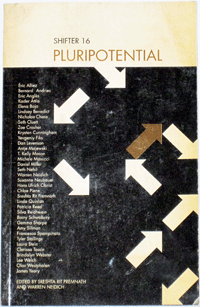 In: Philosophy Today, 2007, vol. 51, pp. 98-106. Patricia Reed, "Potentiality and the Politics of Indistinctive Equality" in Shifter Magazine, Issue 16 on 'Pluripotential' eds. Sreshta Rit Premnath and Warren Neidich.